Hi everyone! Very excited to share with you this interview with Mark Garner. Mark is a good friend of mine but also a great handpan maker. His handpans are called Saraz. Well He is a passionate and you’ll feel it while reading. Hi bro! Could you tell us a bit more about yourself? (Your career path, when you started playing and then building handpans, where you live, and anything else about your personal life). Hi David, Thanks for the invitation. Hi MasterTheHandpan readers! Well, so…I first heard about the Hang in 2005 and first played one in 2009 while living in Switzerland. In 2011, I was blessed to purchase a Pantheon Steel Halo and was quickly captivated by the instrument. Not long afterwards, I tried to purchase a few more handpans in order to build a chromatic set, however I quickly realized that high quality handpans were very difficult to purchase. I had been working in construction for a while and I thought: “How hard can it be to make one of these instruments?” One year later, hundreds of hours of hammering, thousands of miles traveled around the world to watch other builders, and tens of thousands of dollars spent, I realized it is quite difficult to build a high quality handpan. By that time, I had no choice but to keep moving forward however and continue developing my craft. 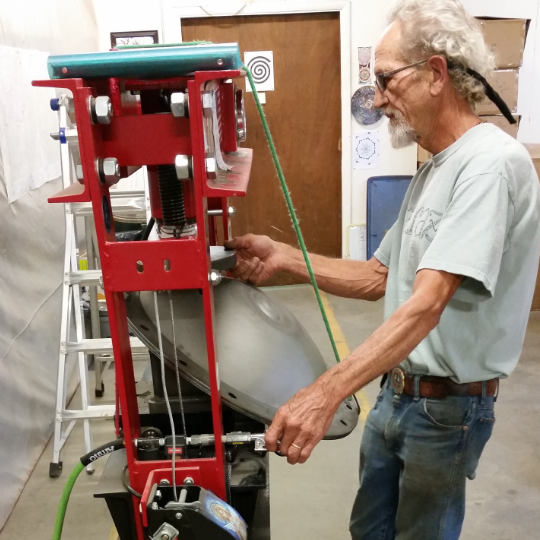 In late 2012, I finished the first Saraz prototype in Asheville, NC, USA. Since then, I developed a team of people to craft the Saraz. Together we have achieved far more than I could have done alone. Why did you decide to start building handpans? I had been a hobby percussionist for 15 years before playing a handpan for the first time. Like so many people, I was captivated by the instrument and surprised that so few people were building them in 2011. I was also inspired by how undeveloped the instrument was relative to other professional level instruments, particularly regarding chromatic playing. I felt strongly that the world really needed more of these instruments and had an overwhelming desire to build them. How did you find a name for your instrument? What’s the story behind it? I was looking for a name without preconceived meaning. One day, I read the myth about the Hindu Goddess, Saraswati. The story touched me deeply like the sound of the handpan. The first part of the name, Saras, can be translated as many things including “Flow” and “water”, which seemed appropriate for the free flowing inspiration that can come from playing. With reverence and respect for Hindu religion, I felt that I should slightly alter the word so I changed the final S to a Z. What do you like the most about the handpan and the community surrounding it? I love the tone and timbre of these instruments. While they are generally still more simple in design and layout than a steel pan, many people, myself included, feel that the tone and more controlled timbre is a further evolution of tuned steel by controlling the upper partials that make the steel pan more wild sounding. The focus on a 1:2:3 wave form ratio of fundamental, octave, compound 5th has a special dynamic. Being able to play in a single scale without thinking is very appealing for many people, including myself when I want to relax and meditate in a flow of music. These instruments touch me deeply as they touch many other people as well. While it is hard to put in words, I feel there is something very special and even magical about handpans that cannot be found in many other musical instruments. The handpan community continues to grow and develop. I have traveled worldwide to visit other handpan players, builders and events. This instrument attracts very nice and interesting people from every culture, age group and background. The community has changed my life, as I have met many of my best friends in the last few years through it. I have also been deeply inspired by some of my favorite players and other builders. What do you like the most about making instruments? The process is endlessly engaging. It has been one of the most difficult and also rewarding activities of my life. Being at the forefront of this art form and helping to develop it has also been very inspiring. 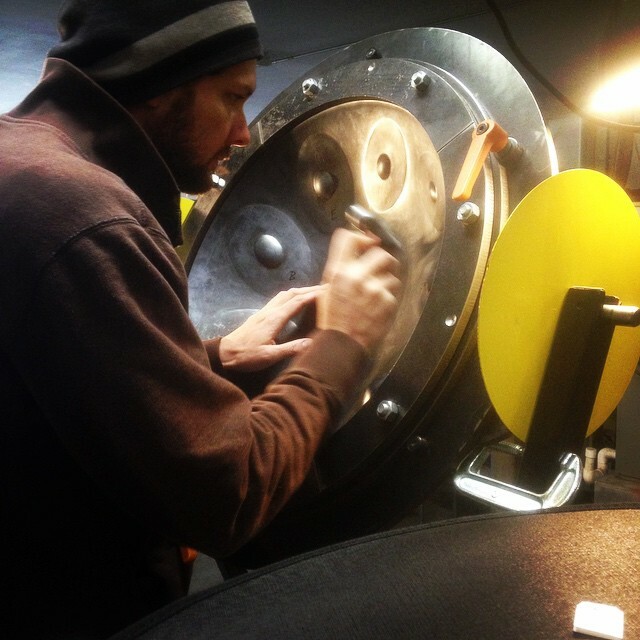 There are many ways to build a handpan. We have explored many different building techniques and designs at every stage of the building process. What I love most about building handpans however is that we have never grown bored or feel that we can’t develop further. This instrument is young and still has many years of development ahead. There is so much data to collect about what is possible and it is often very hard work to collect that data. The more people that build, the faster the development accelerates. There are few things more rewarding than helping another builder and then 2 years later learning new things in return from them. 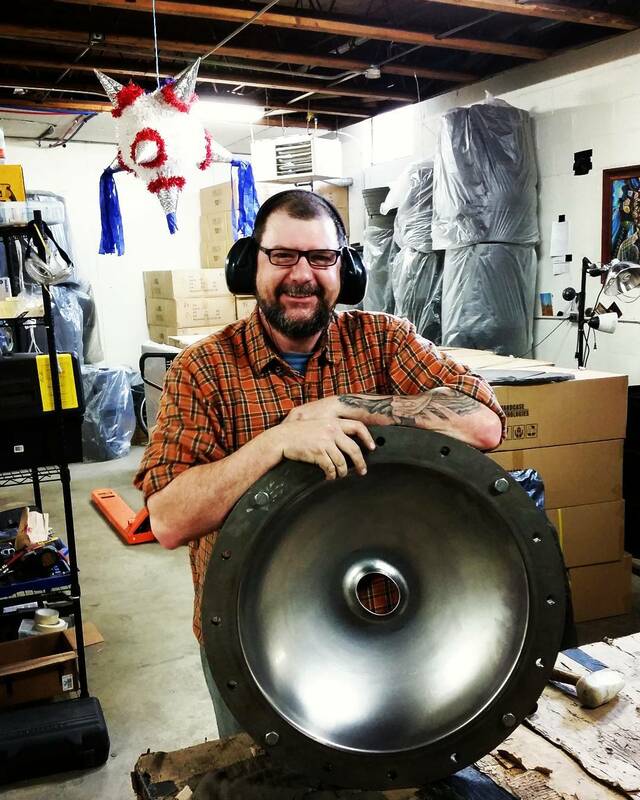 We have an amazing community of players and builders that make this time period of the handpan’s development very special. What are the values you are putting into your work? Early on, I realized that I did not want to build the Saraz alone. The work was too hard and there was far too much data to collect about each stage of the building process. In the first year, I started developing a team to help build the Saraz. With a team, it has allow for each person to focus their energy on particular stages and then report back what they find. We have accomplished much more in a much faster time period this way than I could have achieved alone. 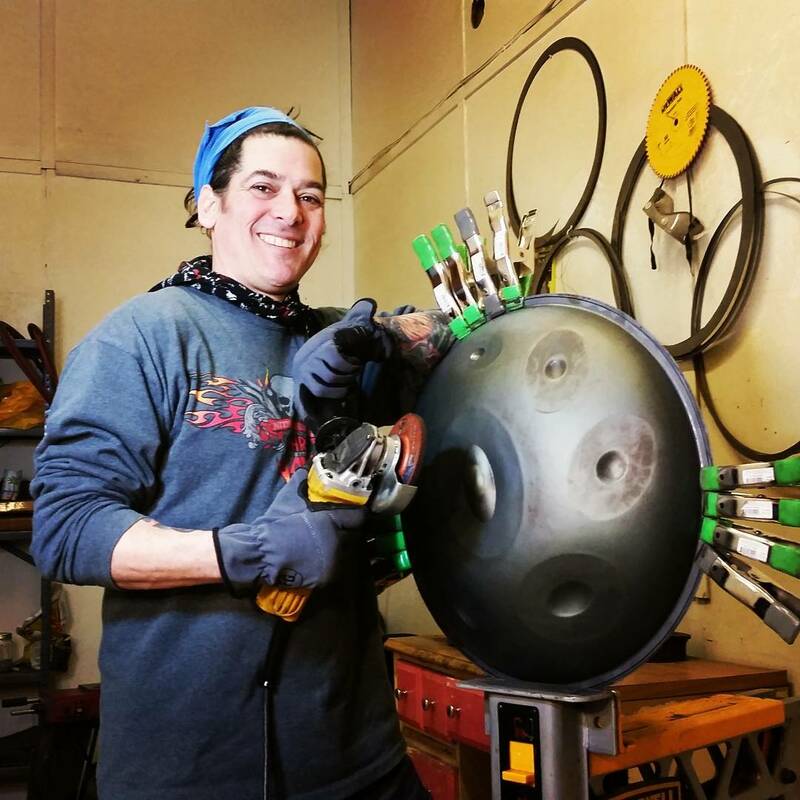 For the first few years, we explored many different ways to build a handpan. In that time, few people had achieved an instrument. There was very little building information publicly available until myself and a few other people started sharing it publicly as we each learned more and more about the building process. In the last few years at Saraz, we have focused on finer and finer details while putting our energy into building the finest quality we can achieve for our chosen building methods. This has included developing techniques for more solid tuning stability through the architecture of the instrument; developing dynamic response of the note to a touch that is very soft, hard and everything in between; tuning all of the shoulder tones on the center note; isolating and muffling undesired tones on the instrument; and learning more about the sonic physics of frequency interaction on these instruments. While our instruments have developed and evolved over the years, our most important value has always been to put our heart, soul, passion, and patience into each instrument in order to make it our finest Saraz yet. We could immediately triple or quadruple our production rate without those values, however it would be at the significant cost of quality. This has simply never been a consideration. Tell us about your most recent creation, what’s so special about it? Many recent individual Saraz have grabbed my attention. Like all handpans and Hang, each one has a unique personality of nuances. One of my favorite recent creations however has been the culmination of a dream come true. 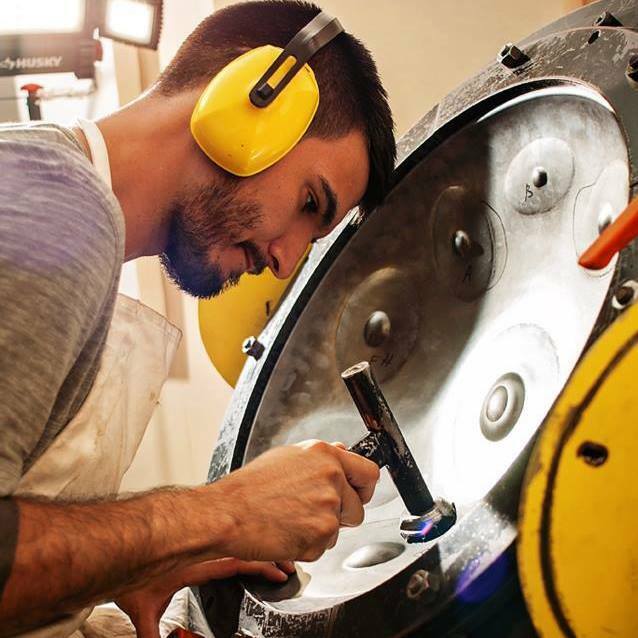 We were one of the first Handpan builders to explore chromatic sets during the beginning of our production. After 5 different sets, we built my favorite set yet in 2017. The set features every note from B2 – D#5. Across 3 sizes of instruments, we were able to maximize stability for each note’s resonance in the chamber including elusive notes like Bb4. This project is still evolving as we are currently working on a set of Chromatic Bass Saraz that will range from G2 – G#3 before we continue exploring lower notes. At the same time as designing this set, I have been developing a set of Soprano Saraz and have recently tuned whole tone notes as high as C#6 with a crisp octave harmonic on all sides. I dream that in time we will build professional quality sets like this for university music programs all over the world so that the professionals of tomorrow can further develop these instruments far beyond our wildest dreams as well as integrate them into every genre of music possible. What’s the process for buying one of your instruments? It currently takes about 3-4 months’ wait for us to finish a custom instrument. We also post flash sales monthly on our website. Do you have an anecdote or funny story related to the handpan? I have heard many stories about how the handpan has touched people deeply and inspired them. I remember one particular story the most often however. A friend was busking when a little girl of about 5 years old came up and started dancing. Inspired by the girl, my friend kept playing and the little girl kept dancing. 30 minutes later, his fingers were starting to hurt and he needed to stop even though the girl was still dancing. Afterward, the girl’s mother came over to my friend and told him that her daughter was autistic and had never danced in her life until that day. The mother was amazed and like so many of us wondered why this instrument inspired her daughter so deeply. Can you give us a saying, a punchline about handpans or anything else? Is there anything else you’d like to add that I’ve forgotten? We are often asked what makes the Saraz unique and different from other builders. We have been building handpans for longer than most builders. As a team, we have also accumulated far more experience than any one person could have achieved in the same time period. We have spent years developing our process while also sharing much of those lessons learned with the world. It took us years and hundreds of instruments to understand different forming methods by trying each. We prefer hammered shells for many reasons that go beyond just tone and timbre while few other builders still hammer shells when easier forming methods are available like deep drawing, rolling, or hydro forming shells. After spending years exploring many methods of trying to adapt every scale to one size instrument, we were one of the first builders to offer multiple sizes in order to open up our offered scale list. Because of three sizes, we currently offer one of the largest scale lists of anyone. We have learned subtle nuances in the building process that consistently control balance of every note and partial as well as the tuning of shoulder tones and control of unwanted tones. While we have come a long way in our development, we are also exploring new paths every day and always asking ourselves how we can further develop the Saraz and the handpan art form in the future. If you were lost on a desert island with only one scale, which one would you choose :-)? Do you have any advice for someone who wants to start making handpans? Consider not only how passionate you are about the handpan, but also if you are willing to be incredibly patient after repeated failures. Consider if you want to work very very hard for the instrument by hammering for at least hundreds of hours. Consider if you are able to do this work, which is not only physically demanding but also very emotionally and mentally demanding. If you want to build handpans as a business, consider that today there is more and more of a balance of supply and demand while the speculation “bubble” has popped. The art form is not like it was in 2012 with endless demand. Every builder that has arrived from 2015 onward has worked very hard to make a name for themselves. Many of them have struggled in the last 2 years to sell instruments and will continue to struggle more and more as the business side of the art form becomes more competitive. As the market continues to balance, entry level handpans have become very affordable making it increasingly difficult for a new builder to establish a name for themselves and make a decent living at this very difficult job. If you are still passionate about the building process after considering those things, learn as much as you can about the process by researching. I have continued to share a great deal of information about my own research into building that can be found on the Saraz website. Books like “The Secrets of the Steel Pan” have many insights as well. Beyond building, it is very important to first be a player and understand the nuances of what makes a great handpan. It is also important to realize that even if you have a solid mental understanding as well as plenty of playing experience, much of learning to build is training one’s muscles to do the job efficiently well. This practice and skill only comes from thousands of hours of hammering. What are the best 2 or 3 best videos of your instruments? Thank you Mark! Long live to Saraz and say hi to the whole team for me. Where to buy a handpan?